Two of the state’s top men’s collegiate programs entered Saturday with high hopes of advancing in their respective NCAA Championships, but only DU men’s lacrosse will live to see another day as CU men’s golf came up short in the final round of regional competition. 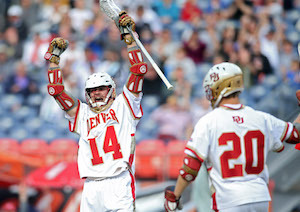 DU advanced to its fourth Championship Weekend (NCAA semifinal) appearance in five years by defeating Ohio State 15-13 on Saturday at Sports Authority Field at Mile High. The Pioneers rallied from a 7-1 deficit within the first 18 minutes of the game, going on a 9-0 run to take a lead they would not give up for the remainder of the quarterfinal matchup. Senior midfielder Erik Adamson scored the equalizer, his 32nd goal on the season, 36 seconds into the second half and the Pioneers would not look back. Collin Woolford (junior) tallied the eventual game-winning goal with 9:20 remaining. The Buckeyes scored two goals in the final minute to bring the score within two, but Ryan LaPlante’s 13 saves, including 6 in the 3rd quarter, were enough to advance the No. 4 Pioneers to Championship Weekend where they will face top-seeded Notre Dame in the national semifinal. CU men’s golf, meanwhile, entered Saturday’s final round of the NCAA Central/Noblesville Regional tournament in second place and holding a 13-stroke cushion on a possible NCAA Championships berth. 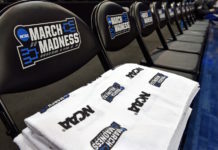 After finishing Thursday’s round one with the best team round of the tournament (277), the Buffaloes carded disappointing rounds of 300 and 302 on Friday and Saturday, respectively. 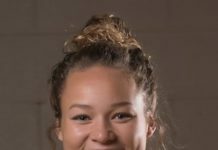 They finished the tournament in sixth place, eight strokes behind Oregon, who secured the fifth and final team bid from the region. The lone bright spot for CU on the final two days of play was senior David Oraee, who earned an individual berth in the Championships, finishing second overall with a three-day total of 209. DU faces Notre Dame on Saturday, May 23 at 11 a.m. MDT at Lincoln Financial Field in Philadelphia. The game will be broadcast on ESPN2. Oraee will compete in the Men’s Golf Championships May 29-June 3 at The Concession Golf Club in Bradenton, Florida.